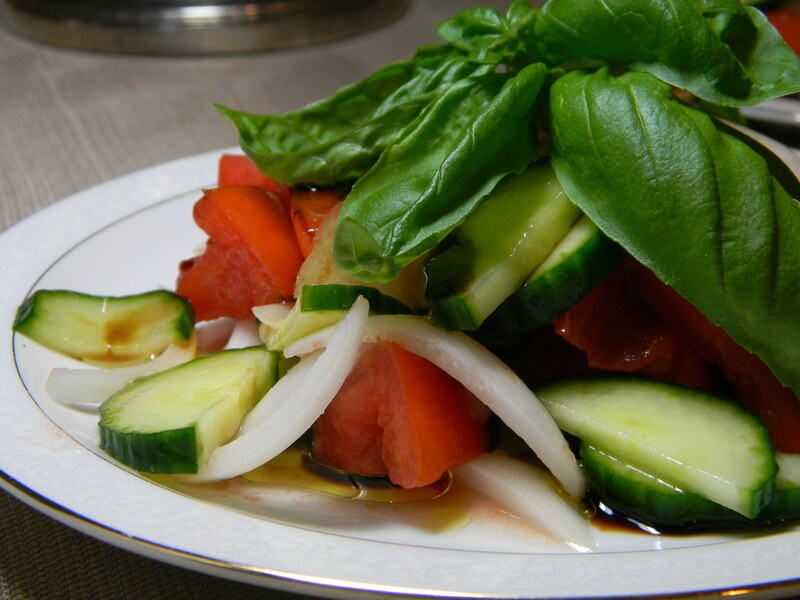 About an hour before serving, cut the tomato, cucumber and onion into bite-sized pieces. Don’t worry about peeling or seeding the tomato or the cucumber. Place the veggies in a large bowl as you slice them. Once finished with the slicing, sprinkle the salt over the top, and then mix the bowl together. Cover and refrigerate for about an hour. Remove from the fridge, and toss with olive oil and vinegar. The most authentic choice would be a little white vinegar, or white/red wine vinegar. Sherry vinegar would be good if you’re going for the fancy Spanish option. We have a bottle of aged balsamic vinegar that we love, and even though it isn’t 100% authentic, it tastes delicious. Evenly divide the veggies between two plates, and scatter the basil leaves over them. Give a few cracks of black pepper to each plate, serve, and enjoy! Makes 2 first course or side salads.